The mockup below, has a screenshot of a software I stumbled upon last week. It grabbed my attention that it presented information in the following way. 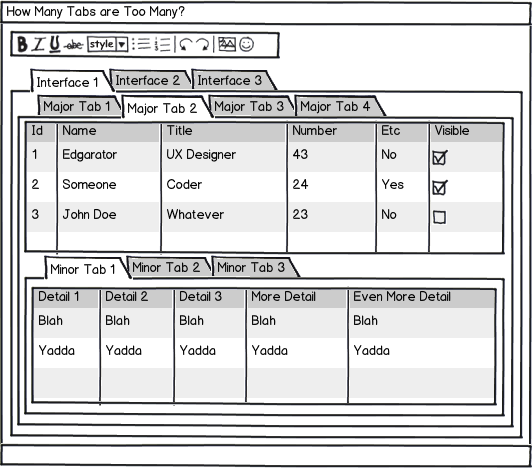 It had Many Interface Level tabs, inside those, it had many Major level tabs, that contained many Minor tabs. I want to stop there, because it gets confusing. What I want to know if how to reduce complexity by reducing the number of tabs presented for the user. The system itself is complex, but I'm pretty sure there should be better ways of presenting information. The information above and the mock-up below might seem insufficient, however, it might give you an idea of the problem. The application is window based (no browser). One quick solution I see, would be eliminating Interface level tabs and creating separate windows for those specific interfaces. But then I wouldn't like to have that many Major and Minor level tabs. Is there any usability standard that would suggest the wise use of tabs? The problem with tabs within tabs is mostly visual, not logical. The situation you describe has three navigation levels - that's not that uncommon. If you make the different navigation levels look different from one another, you'll find that the perceived complexity is reduced. Wow that really is a complex situation you have there. I usually try to avoid situations where I have to have a tab inside a tab because it starts to get confusing as to where one tabbed area finishes and another tab begins, which would be made even more confusing if each of your interface tabs also had the same major and minor tabs within them. 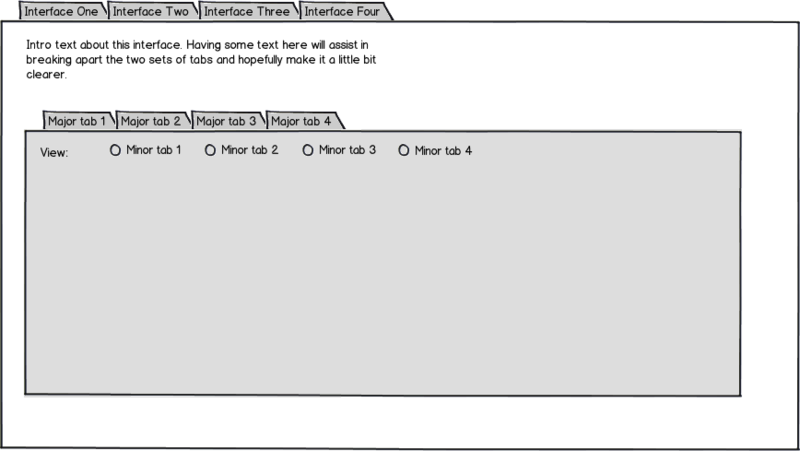 The user would look at some of the content and constantly have to be referencing back so they don't get lost "OK, this piece of information was within minor tab 3 which relates to major tab 4 on interface 2"
If there is no other way around it you could pull off two levels of tab groups if the design can visually separate them and use things like shading and enough white space to show the hierarchy. As for what to do with the third level would it possible to have a set of radio buttons to select what information to view? I know it's still not the prettiest solution but I think it is at least a bit better than just having many levels of tabs, hope this helps. Easily understood and accurate mental models are best for users. A general rule-of-thumb is: If your interface is complex, then the mental model most likely is as well. In this case the tabs seem to introduce a lot of possible confusion. I would guess that either a UX designer didn't create this or they were lazy, because things like this should be abstracted more. But keep in mind that I know nothing about this interface experience and it's intended use/purpose and as with most things "it depends", so maybe this was the best design compromise. Not the answer you're looking for? Browse other questions tagged navigation tabs data or ask your own question. Is it ever okay to have multiple rows of tabs? Are double tabs on the same level acceptable? Products in Tabs - Bad idea? How to combine tab bars and navigation controllers? Ways to group too many tabs & views? Responsive web app, bottom tabs for secondary navigation or primary actions?